They say basketball is a make-or-miss game. 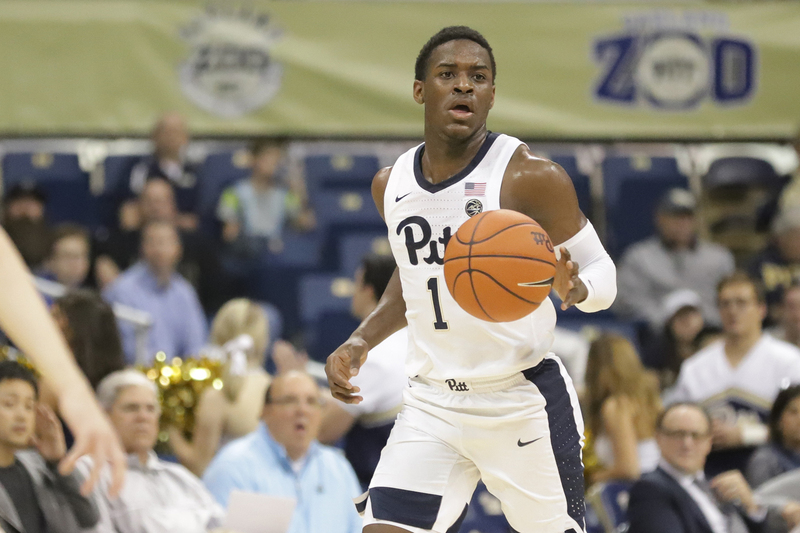 In Pitt’s first meeting versus Louisville, the Panthers fell on the beneficial side of that mantra, making 52.5 percent of their field goals en route to a drought-breaking upset win. But Pitt fell back to earth in Saturday’s rematch, shooting just 35.2 percent from the field in a 66-51 loss at No. 23 Louisville. No Panther was immune to the scourge, as every member of the starting five shot well under 50 percent. The free throw line — typically viewed as a safe haven for the Panthers, who shoot the 10th-most free throws per game nationally — was no less hostile. Pitt got to the line a season-low 13 times and made just seven of those attempts. That was their worst percentage from the charity stripe this season, aside from… their first matchup against Louisville, in which they prevailed in overtime despite making 16 of 33 free throws. To make matters worse, Pitt turned it over 17 times, which ties the team’s third-worst mark of the season. The Panthers’ talented first-year backcourt duo of Trey McGowens and Xavier Johnson were the primary culprits, coughing the ball up five times each. Speaking of Johnson, it was an especially rough game for him. Four days after snapping his Pitt first-year record of 18 straight games scoring in double digits with an eight-point dud against Duke, he turned in another single-digit performance, scoring nine points despite taking a team-high 13 shots. Johnson struggled from every area of the court, going 4-13 from the field, 0-2 from three and 1-2 from the free throw line. All issues considered, it was Pitt’s lowest point total this season. However, the final stats betray the fact that it was a close, back-and-forth ballgame throughout the first and early second half. In fact, Pitt went into the halftime locker room leading 33-29. Senior forward Jared Wilson-Frame, making his return to the starting lineup after two straight games in a reserve roll, came out firing. He hit his first two 3-point shots, the second of which gave Pitt its first lead of the game at 9-8 with 13:26 left in the first half. A McGowens fast-break layup put the Panthers up by three, but they found themselves stuck at 11 points for the next six minutes. When sophomore guard Kham Davis finally sunk two free throws to break the funk at the seven-minute mark, Louisville led 17-13. Pitt’s best stretch of the game came in the closing minutes of the first half. Johnson showed off his skillset by splitting two defenders and twisting into the lane for an acrobatic reverse layup to bring Pitt within one, then Wilson-Frame made an awkward but effective baseline layup to give Pitt the lead back, 25-24. Pitt graduate guard Sidy N’Dir took over from there, knocking down two 3-pointers and dishing off an impressive assist to junior center Kene Chukwuka for a layup right before halftime to give the Panthers their 33-29 lead. N’Dir was one of the team’s few bright spots on the day, going 3-4 from the field and 2-3 from 3-point range for eight points. Wilson-Frame started off the second half on a high note once again, knocking down a contested three to put Pitt ahead 36-31. Louisville took the lead back momentarily, but a McGowens and-one take to the basket made it 39-38 Pitt with 15:37 remaining. That would be Pitt’s last lead of the game. As they did at 11 points, the Panthers again got stuck at 39, missing shots from all over the court while turning the ball over repeatedly. Johnson finally got the team to 41 with another circus-style drive to the hoop at 9:33, but by that time Louisville led 46-41. It only got worse from there — Louisville sophomore forward Jordan Nwora snuck behind Pitt’s zone defense and threw down an emphatic alley-oop slam all over Chukwuka, putting the Cardinals up 53-44 with 7:36 left. Although the Louisville lead stood at just nine points, it felt like far more, with the home crowd going wild and the Panthers looking visibly defeated. Nwora scored Louisville’s next four points as well, giving the Cardinals a double-digit lead that never fell back to single digits. He finished with a game-high 17 points, with 14 of those coming in the second half. Neither team scored much from that point on, as the Panthers turned it over four more times — the same amount they committed in the entire first half. Louisville junior center Steven Enoch knocked down four free throws to help ice the game, and any chances of a Pitt victory trickled down with the clock until no time remained, giving Louisville a comfortable 66-51 victory. The Panthers’ 18 second-half points were their lowest in any half this season, bringing them to a season-long losing streak of three games. The Cardinals improve to 6-1 in ACC play, moving them into a tie with Duke and Virginia for first in the conference. Pitt, on the other hand, falls to 2-5 and stays on the road for its next game at Clemson on Tuesday. Tip-off is scheduled for 9 p.m.